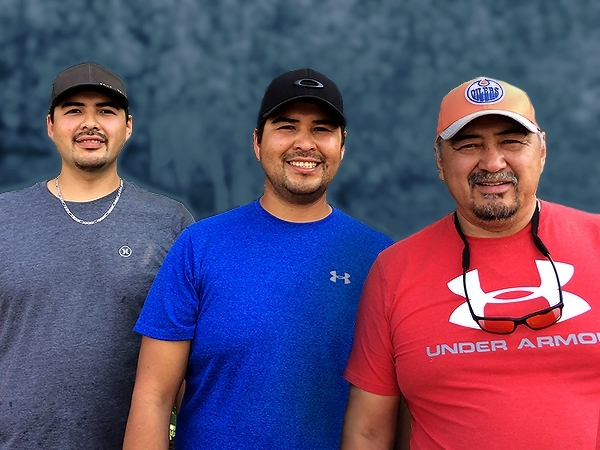 Victor Jr. and Marty watched their dad, Victor Sr., leave their home community and trek to Rabbit Lake as kids, and it wasn't long before they followed in dad's footsteps. Now the Fern brothers are working in the mines and have family of their own to support. For the Fern fraternity from Fond du Lac, Cameco is a family affair. Marty joined Cigar Lake operation in 2009 while Victor Jr. got his start with Rabbit Lake in 2007. And today, the Fern brothers have gone beyond simply taking after dad – they have moved into supervisor roles and hope to inspire others in their community and the north. "I feel very fortunate that my brother and I have moved up in such a short time and the impact we can have for other aboriginals in our communities and with young people," said Marty, 27, who was only 24 when he became a process foreman at Cigar. "It's pretty rare at our age to be in this position so it's a perfect opportunity to motivate and show people that anyone can do this if they have the heart and work ethic." That work ethic and passion was instilled at an early age by their dad, who also ran a Sawmill in Fond du Lac and a commercial fishing operation. When he would leave for his weeklong shift at Rabbit, Victor Jr. and Marty always had chores to do and they pushed each other to do great work. "One of the things dad taught us was how to do the job properly and importance of working safely," recalled Victor Jr. "We always had a few guys working with us, so we'd oversee and make sure things were done properly, so safety from a young age was a very important priority. But the biggest thing was that he kept us motivated and wanted us to be independent and move forward with our lives." Those early lessons clearly stuck. Victor Jr. took his electrical apprenticeship at Rabbit in 2007 and became electrical and instrumentation foreman (at 30-years-old) in 2016 when the site when into care and maintenance. Marty first got his feet wet at McLean Lake after high school working as a mill operator, which he parlayed into a process operator job at Cigar in 2009. But for both brothers, landing a job with a cream of the company crop in northern Saskatchewan wasn't enough – they both have a strong desire to develop. "The way I see it is I have to challenge myself daily and stay motivated and goal-oriented," said Marty. "I'm always asking myself what I can do differently for the company and how can the company be more efficient. I've been lead hand since 2011 and now a foreman for over two years and I keep learning and gaining more experience and that's been exciting for me." Victor Jr., meanwhile, got his first taste of supervisory experience in 2012 and sees even brighter days ahead. "I've still got lots to learn so it'll take some time before the next step but I'm up for the challenge and willing to learn new things so that's what I plan to do. I definitely want to continue to move up in the company." The family connection at Cameco goes even deeper as Victor Jr. got the opportunity to work with his dad at Rabbit in 2008. And now Marty has the same opportunity at Cigar with Victor Sr. on his shift when they start the new two week in two week out schedule. "It's awesome that my brother and I will both get to work with him at Cameco," said Marty. "He's been such a great influence and he's definitely shaped us and helped instill the way we approach our lives and our work. Cameco has been really good to us over the years and we've all had a chance to really develop and grow as people and support our own families, so it's been pretty special for all of us."